At Cushion Clearance, our experienced sewing department can create cushions of any shape and size. Any cushion that is not a square, rectangle or one of the shapes that we offer online is considered a unique-shaped cushion, and we must have a template or pattern to go by to ensure we make exactly the cushion you need. All unique-shaped custom cushion orders require a template. 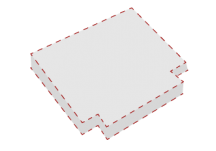 A template is simply a paper or cloth pattern cut to the shape of the cushion you need. Please do not use stiff paper, cardboard or tissue paper. Thick butcher paper or the underside of gift wrapping paper seem to work the best for creating a reliable template. Sometimes, over the years well-worn cushions become misshapen. 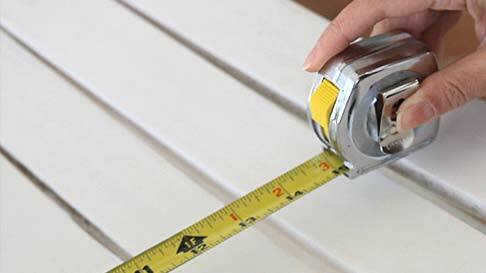 It is strongly recommended that you measure your existing piece of furniture or space. DO NOT measure the old cushion. Lay a sheet of paper on the chair seat and press the paper flat all along the bottom of the seat. Make sure to press the paper down firmly along the outside edges of the seat. Draw around the outside edges of the seat where you would like the edge of the custom cushion to be and cut out the shape. Keep in mind, we will make the cushion to the exact shape and size of the template that you cut out and provide us. If you would like rounded corners, please cut out the exact rounded corners you prefer. After you have cut out the pattern, test that your pattern fits as well as possible. If you need to reshape an area or extend your pattern, just make sure you securely tape the paper together. We only need one pattern for each shape of cushion that you need. To equally balance your pattern, simply fold down the middle, cutting where necessary. It may take a couple of attempts before you are satisfied with your drawing or your pattern. Again, your new cushion will be cut to exactly the same shape as your finished pattern, so please double-check your pattern on your furniture. Please mark your pattern with your name, invoice #, thickness, quantity, fabric choice (as ordered), where the zipper should be placed and any other options such as tie and break locations. Please DO NOT send templates without ordering your Unique Shape cushion first. It is important to label your template with your order reference number located on your receipt. Once your order has been submitted you will also be notified that we are waiting on your template before we can build your custom cushion order. If you have any questions, please contact customer service at 800-510-8325. Hint: When placing a template order, the easiest way to enter your dimensions is to measure your template. If your cushions are replacement cushions for a specific furniture set or collection, please label each template with the manufacturer and collection name, as well as any identifying serial numbers and codes. Paper templates can easily be folded and mailed inexpensively. Please do not roll templates and mail in tubes. Since your custom cushion will be made using your template, it is extremely important to create an accurate template. Templates must be made and cut out to the exact shape of the cushion needed. Do not send existing cushion shells as templates. Please be aware that templates sent to Cushion Clearance become the property of Cushion Clearance and WILL NOT be returned. This video gives step-by-step instructions on how to create a cushion template. The following are labels you'll need to add when sending your template. Note that all labels may not be required for your cushion or style. Changes to your order cannot be made by writing new choices on your template. Please contact our customer service department to make any changes to your order. Please fold templates flat. DO NOT roll templates.